I read magazines daily and yet with my schedule, it takes me a while to get through all the magazines I like (and then longer to find time to blog about them). 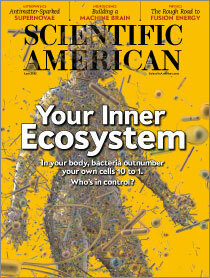 May’s issue of Scientific American had a fantastic article, , How Bacteria in Our Bodies Protect Our Health, by Jennifer Ackerman about the bacteria in our bodies and how we actually could not survive without some forms of bacteria. The article is well worth the read. If you don’t subscribe, you can preview and then buy he article via this link. Better yet, why not subscribe here? (Yes, I do subscribe myself, but other than that I have no affiliation with the magazine or its staff.) Scientific American is a very well researched, in-depth publication, that offers up the latest in scientific discovery. And it comes with shiny four-color pages. More on our inner ecosystem, bacterial roommates and life savers in the New York Times article, Tending the Body’s Microbial Garden, By Carl Zimmer here. If you are more of an auditory learner, check out this podcast, “Your Inner Ecosystem” from NPR’s On Point with Tom Ashbrook here. I found this link via blogger StrangeHealth whose take on bacteria and probiotics is also interesting. As Strangehealth so succinctly puts it, “Humans were designed to co-exist with bacteria in our environment.” Check out his synopsis of the NPR podcast here.